PreCheck, a healthcare exclusive employment and background screening firm, recently received "Best Blog Website" award in Web Marketing Association's 2014 IAC Award Competition. PreCheck, an employment and background screening firm specializing in the healthcare industry, recently won an award for outstanding achievement in Internet advertising in the Web Marketing Association’s 12th annual Internet Advertising Competition (IAC). The PreCheck Blog earned the IAC Award for “Best Blog Website”, capturing the top award in its category. Each year the winner is selected based on seven criteria: design, ease of use, copywriting, interactivity, use of technology, innovation and content. 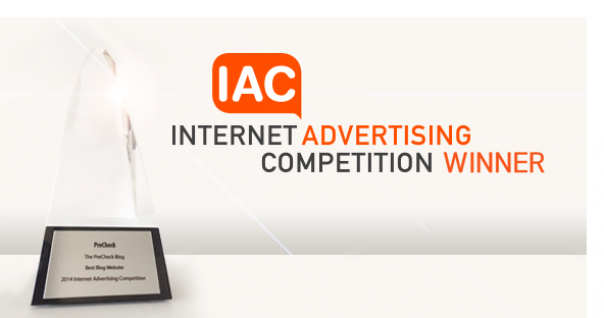 Produced by the Web Marketing Association, the Internet Advertising Competition is an annual awards program that honors excellence in online advertising, recognizes the individuals and organizations responsible, and showcases the best in Internet advertising. First conducted in 1999, it is the first and only competition dedicated exclusively to online advertising. PreCheck launched the PreCheck Blog in June 2012 as a resource for healthcare human resources professionals, medical staff services managers, healthcare compliance officers, and allied health educators and program administrators. As a healthcare-exclusive background screening firm, PreCheck’s blog covers background screening best practices with a healthcare focus as well as the latest healthcare trends and regulatory issues. The Web Marketing Association (WMA) was founded in Boston in 1997 to help set a high standard for Internet marketing and corporate web development on the World Wide Web. Staffed by volunteers, this organization is made up of Internet marketing, advertising, PR and design professionals who share an interest for improving the quality of advertising, marketing and promotion used to attract visitors to corporate Web sites.